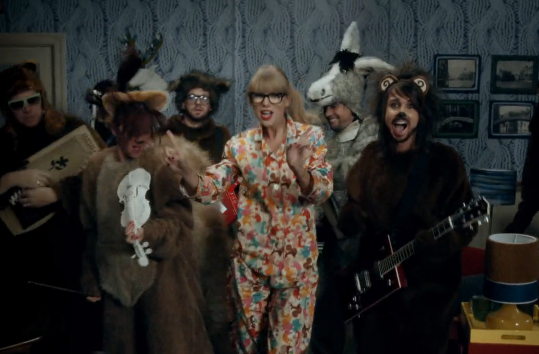 Taylor Swift dancing in her pajamas with people in bear costumes playing guitars. Pretty much summarizes the entire video. I’ve waited to share my thoughts on Taylor Swift’s latest song until its music video came out. Now it is time for Thomas to brutally analyze and tear apart T-Swift’s latest work… well, not really. At least not in third person. Two Sundays ago I was alone in my best friend’s apartment doing laundry, and guess what song I sang and danced to the entire time? “We Are Never Ever Getting Back Together”. The fact that I’m unafraid to admit it shows how catchy this song is – unless her shining success on the charts is enough. I mean, the song title has twelve syllables, and Swift still manages to make it an upbeat, sing-along friendly pop tune. But, that’s all it is. A sing-along friendly pop tune, that doesn’t really leave you desiring anything more. As I posted on Twitter when the song first came out, I somewhat wish that I had a worse relationship with my ex so I could empathize with Taylor Swift more. This song almost screams immaturity – I love the confident “I’m not gonna cry over you” vibe, but it seems like Swift is regressing when it comes to the quality of her songs and her lyrics. One of my friends pointed out “Dear John.” In this song, Swift describes her heartbreak subtly and beautifully, attacking her ex but restraining herself in an almost svelte way. In “White Horse”, Swift sings about her loss of innocence and her battle with a boyfriend’s betrayal by alluding to the popular white horse found in fairy tales. Even in her more direct and confrontational song “Picture to Burn”, she uses metaphor to compare her past with the guy to the picture that she’s setting aflame. In “We Are Never Ever Getting Back Together”… that’s it. Taylor Swift will never get back together with her boyfriend. Ever. Instead of reading books, Taylor Swift talks about her relationship problems on a home phone alongside a stuffed animal. I like the red, though. Basically, the big picture point here is this: not every single thing is about relationships or romance. A lot of people have this problem with Swift’s work in general, but I never found it an issue because of how she sprinkled in songs like “Mean” and “Safe and Sound.” Even then, her songs about relationships were clever and had some cunning within their lyrics, but “We Are Never Ever Getting Back Together” is literally a song about Taylor Swift not getting back together with her boyfriend. Nothing more, nothing less. Need I remind everyone that she’s 22? Swift exudes charisma in this video, and I found the whole room with leafy wallpaper to crazy club transition amusing. Well, what did is there to expect in a music video for a song like this? Swift boxed herself in rather tightly when she wrote and produced a song solely about not getting back together with her boyfriend. It’s clearly not the most mind-blowing music video ever, but considering what she had to work with, I think she/the directors did a stellar job. They avoided releasing another linear breakup video, and the constantly traveling cinematography kept my attention. The atmosphere of the video just felt like fun, which I think is the best thing they could aim for, as it suits the style of the song and doesn’t feel contrived. Overall, I feel indifferent toward this song and I like its music video. If Swift’s goal was to bring attention to her upcoming album by first promoting a bubble-pop track, then she’s on the right path – hopefully, she has more to offer with the release of Red on October 22. I didn’t really analyze the song, just listened to the cute beats.I didn’t know the music video was out but your pictures were enough, ah she looked kind of silly and sweet the same time with the stuffed animals, maybe she was seeking comfort from them? And yes, I was surprised that she pulled off such a long line “We Are Never Ever Getting Back Together”, too! I agree, it’s definitely catchy! Hmmm, I’m in two minds with this song. I don’t think there’s anything wrong with letting her have a more immature song now and again, it’s hard work being grown up all the time if you don’t have a little fun. I also think it reflects that kind of breakup situation, when it comes to an ex, you can often become immature and petty. Sure sometimes it can cause epic songs full of metaphors and dramatics but there are other sides to it too, and I think that’s what this song reflects. However, I do also agree with you, it is a very one dimensional song, and it’s not one of my favourites of hers because it’s very repetitive, and I much prefer her country songs! Yeah… I see what you mean. I guess it’s one of those brain-candy songs, though some of her other songs verged on immature/petty without being one dimensional. But, still love T-Swift, and despite this one not being one of my favorites I have hope for what she’ll produce in the future. Thanks for reading and commenting! I really like this song, I actually have it on my latest post. Thanks! I really enjoyed reading your rant, by the way. Whenever you wrote it…it has been a long few days so I cannot remember when you wrote it exactly, but alas, it was great! Ha ha thanks, I enjoy reading your occasional rants as well! The song is catchy, however I was expecting something much more grown up. I did not like the video; I think the people in bear costumes idea is ridiculous and immature; something i would expect from a Disney singer, not an artist of her calibre with multiple awards. I also read in an interview that she said they shot the whole video in ONE take, which clearly states she did not put effort and dedication in it. As a fan I am very disappointed. Hm… I can see where you’re coming from. The animal costumes were unusual and that’s an interesting thing she in the interview – I wonder if she had a reason for doing that as opposed to just being lazy. I do wonder though how a video for a song like this could have been better, because she set herself up for a somewhat odd video like this one or a more typical realistic breakup video. Either way I feel like she couldn’t have accomplished anything too fantastic. Anyway, thank you for throwing in your two cents! Hm, really? She was born on December 13, 1989 – so if my math is correct she should be 22, approaching 23 in a few months. It’s the new math!!! Bahhhaaahaaa! I live in Nashville and everyone here loves Taylor. She’ a sweet girl. And she relates to the ‘tweens’ well and is a much better role-model than another famous girl her age from here (whose name I won’t mention), but as a mom, I do worry about her after seeing the interview with Katie Kouric the other night. She appeared kind of down on herself and lonely. I want her to start living more like a 22-23 yr old young woman than like a 16yr old. I want her to have friends, go on fancy trips with friends and have parties, etc…that are age appropriate so she can mature and grow into someone who has MANY things going on in her life so she has plenty to write about. I agree! Taylor Swift is such a successful and intelligent singer and song-writer, she should be taking advantage of her age and the opportunities it allows her. I’m sure she is aware of how many young girls and guys she influences, so hopefully she really is living to the best of her ability. I fancy the guy in the bear suit – what is his name? I’m not sure, sorry! He does possess admirable enthusiasm. I love this song and video. I actually can’t quit playing it and singing it, and I am 38. What does that say about me? Anyway, this song reminds me not to go back to a guy that I sometimes would like to. And the making of this video absolutely blows my mind! She changes outfits five times, and although they did it several times, the video is done in one take. It’s not like they cut and spliced together. It is quite the infectious tune! And yeah, it is impressive that she pulled all of the tricks (such as the costume changes) in the video in one take – while some may say that was a lazy thing to do, it does showcase her efficiency. Thanks for reading and commenting! I know a lot of people have complained about the lyrics of this song being “immature”, but I personally think they are genius, for a couple of reasons. Firstly, Taylor has said that her ex is the kind of person who hates these kind of pop-py, catchy, radio-ready songs with simple lyrics (which is what that indie record line in the song is about), so by making the song this way it adds to the whole sense of just being annoyed and wanting to piss off your ex that the song has. Secondly, I feel that the simple lyrics actually suit the emotions behind the song much better than more poetic or descriptive lyrics would – when you’re annoyed, you don’t feel like writing beautiful poetry, you just want to rant and get all of your emotions out there (or, at least, that’s how I feel). So it works better with “immature” lyrics. (Hopefully none of this seems like an attack on you. I love your post! I just wanted to present an alternative view). Thank you for sharing your perspective – when viewed from your paradigm, the song does go over well. I think it’s generally agreed that the song is immature, but you’re right in that that’s the way Taylor Swift wanted it to be. I don’t know that much about her personal life, but if this succeeded as a revenge/shout-out to one of her exes, good for her. Also, yes, the lyrics do suit the overall feel of the song. The lyrics help create the tone of the song, even, as it’s really light and bouncy and easy to digest. She works the whole immature aspect well… and your comment has made me realize that perhaps the immaturity of the song isn’t exactly a negative thing. Not the best song she’s ever produced, but not the worst one, either. I agree that the music video is splendorous! Thanks for reading and commenting, Alex. I don’t know any place, but maybe someone else will – sorry!